On any given night, there are 52,765 people who fall asleep homeless in Los Angeles County either unsheltered on the street, or in a dedicated homeless shelter. But big numbers do very little to convey who the homeless individuals are. Each case of homelessness is unique to the person experiencing it, something largely lost when trying to talk about a social issue with the complexity, scale, and severity of homelessness in Southern California. What follows is a demographic breakdown using data collected by the Los Angeles Homeless Services Authority (LAHSA) in its 2018 homeless count, or from third party analysis of previous homeless count data by research nonprofit Economic Roundtable. Some information here is also sourced from LAHSA's more detailed demographic survey, used by professional demographers to assess population characteristics. This precise number of 52,765 people was generated by the 2018 "point-in-time" Los Angeles Homeless Count, which canvassed the entire county over a few days last January with the help of thousands of volunteers. That count looks for people who are "literally homeless," a federal government definition of homelessness that means someone falling asleep unsheltered, or in a structure that not built for human habitation like a tent encampment, outbuilding, or a car. The number of "literally homeless" people counted in the homeless count is added to the number of people in homeless shelters for a total number. Although the count revealed a decrease for the first time in four years (and a four percent drop from the 55,048 counted in 2017), the number of people who experience homelessness is likely higher than the count-generated tally because many people who become homeless do so for a short period of time before finding a more secure living situation. The Economic Roundtable estimates that overall, about 103,000 people experienced homelessness in L.A. County in 2017. For context, that's approximately how many people live in Burbank. Researchers also think about 35 percent of those 103,000 people were homeless for more than a year (the so-called chronically homeless). WHERE ARE OUR HOMELESS NEIGHBORS FROM? Sixty-five percent of the homeless people in Los Angeles County have lived in L.A. County for more than 20 years, according to LAHSA's 2018 demographic survey. Three-quarters have lived in L.A. County for more than 10 years. Only about 20 percent of the homeless people in Los Angeles County have lived here for fewer five years. LAHSA's survey also found that 14 percent of the people who are homeless here now first became homeless outside of California, and then moved here. That is, though some of the homeless people in L.A. did come from somewhere else, the vast majority of people experiencing homelessness in Southern California are long time Southern California residents. HOW OLD ARE OUR HOMELESS NEIGHBORS? Homelessness affects people of all ages. One of the most concerning findings of the 2018 homeless census was a 21 percent year-over year increase in homelessness of adults 62 years old or older, about 5,000 on any given night. About a quarter of all homeless people in Los Angeles County (12,698 on any given night) are 55 years old or older, 85 percent of whom are unsheltered. On the other end of the age spectrum are the 9 percent of the homeless population who are children younger than 18 years old, almost all who experience homelessness alongside at least one parent. There are also about 3,000 homeless young people between 18 and 24 years of age on any given night. Many of those people are individuals, but the 2018 homeless count counted 827 homeless households with children where the head of household is 24 years old or younger. About 60 percent of all the people experiencing homelessness on any given night in L.A County — roughly 32,000 people — are between the ages of 24 and 55. About 67 percent of the people experiencing homelessness in Los Angeles County are male, and about 31 percent are female. A further 2 percent of the people LAHSA surveyed identify as transgender or gender-nonconforming. One of the key differences between homeless men and homeless women is the rate at which each population has experienced domestic violence. Fourteen percent of the homeless women surveyed during LAHSA's 2018 count say they are homeless because they're fleeing a violent partner. Only 3 percent of homeless men say the same. Pulling back, 48 percent of Los Angeles' homeless women say they have experienced domestic violence in their lifetime, more than double the 21 percent figure for homeless men. HOW MANY FAMILIES ARE THERE? Though most (84 percent) of the people LAHSA counted as homeless in Los Angeles County are single individuals, about 16 percent (8,300 people on a given night) of those experiencing homelessness in Los Angeles are families. Of those roughly 8,300 people, about 4,900 of them are children under the age of 18. Making sure homeless families don't have to fall asleep in a makeshift shelter or a car is one of the highest priorities for Los Angeles' city and county governments. At the same time, public assistance programs intended to keep families from becoming homeless in the first place, like CalWORKS, are left playing catch-up with an ever-rising cost-of-living, as KPCC reported in early 2017. People of all races become homeless, but black people are significantly overrepresented. 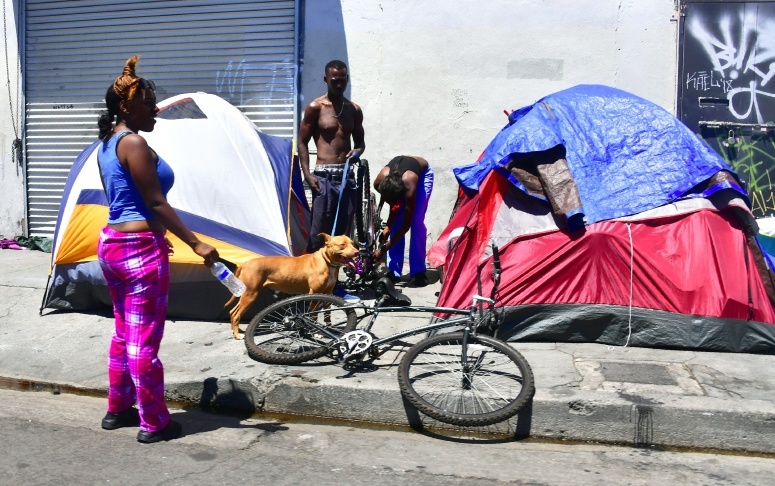 Though black people make up about 9 percent of L.A. County's total population, they make up about 36 percent of the people experiencing homelessness. The overrepresentation is one of the reasons LAHSA formed a working group to analyze black homelessness in Southern California. In December, that group will finalize a report itemizing policy changes local government can make to address the overrepresentation of Black homelessness. Los Angeles' Latinx population, by contrast, is underrepresented among the homeless. About half of the county identifies as Latino, but they make up about 35 percent of people experiencing homelessness. The share of non-Hispanic white people among the homeless roughly mirrors the county's demographics - about 26 percent of the county's total population and 25 percent of the homeless. The remaining four percent of people experiencing homelessness identify either as Asian, Indigenous, or Multiracial. WHAT ABOUT DRUGS AND ALCOHOL? WHAT ABOUT MENTAL ILLNESS? The majority of people who are homeless in Los Angeles County do not report a substance abuse disorder or serious mental illness. According to LAHSA, 26 percent of L.A. County's homeless report a serious mental illness, 15 percent report substance abuse, and about 10 percent report both substance abuse and mental illness. 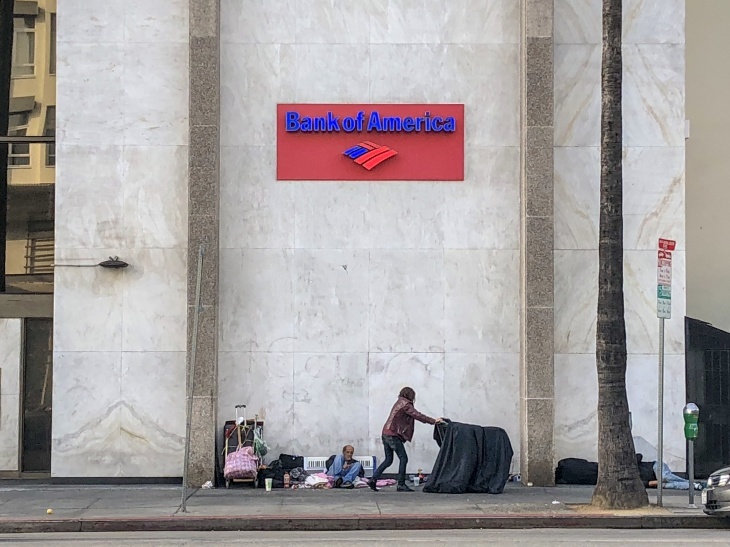 "What the data shows is that 74 percent of the population does not suffer from a serious mental health issue," said Jonathan Hans, who organizes LAHSA's annual homeless count. "If someone is having an episode on a street corner, everyone sees that person. It's very visible. But what nobody sees is the mom getting her two kids ready in the van down the street, because she's trying not to be seen." There's also the fact that homelessness is extremely stressful. Though a person who just became homeless may not have previously struggled with mental illness or substance abuse before they became homelessness, the stresses that come with lived experience of homelessness — things like chronic sleep deprivation, malnutrition, exposure to the elements, and constant anxiety over personal safety — do little to foster long term health, mental and physical. HOW DO OUR NEIGHBORS BECOME HOMELESS? The individual pathways that lead to homelessness are at as diverse as the population itself. The particular circumstances that force a fixed-income senior out of her home are going to be different from a 20-something couple with a child. But there is one major constant: poverty. According to an analysis of homeless demographic surveys by Economic Roundtable, 40 percent of people who are homeless directly cite economic reasons like a lost job for their homelessness. Besides economic reasons, researchers say that about 45 percent of surveyed homeless people say social disconnection is a factor in their homelessness. This includes everything from divorces and breakups, a fight with a family or household member, the death of or serious illness of a family member, having no friends of family to turn to, and domestic violence. On that last point, LAHSA's 2018 demographic survey found that about 6 percent of those homeless are homeless because they fled an abusive living situation. "Homelessness touches every societal issue," said Hans. "When you count 53,000 people on any given night, that's 53,000 unique names with 53,000 unique stories, unique needs, and unique causes." On the spot, Hans listed several reasons why someone might fall into homelessness. "It's 'I just got back from war and I don't know how to deal with what I just saw.' It's 'I'm fleeing a domestic violence situation.' It's 'I have a serious mental health issue.' It's 'I just aged out of foster care and I don't know where to go.' It's 'my parents think my sexual orientation is immoral and have kicked me out.' And then some that aren't even as dramatic as that: 'my company got taken over and I got laid off and I can't afford rent anymore,' or 'my wife got a disease that my insurance won't cover, so I had to foreclose on my house.'" At the core of the problem is the Los Angeles region's high housing costs. Though the region has added hundreds of thousands of jobs in the past two decades, it has not built a comparable amount of new housing to house workers for those new jobs, particularly in neighborhoods where those new jobs are located. That means more people competing for a limited number of housing units, leaving those without a high salary struggling to make ends meet each month. People become homeless when the ends don't meet, and they don't have anyone to turn to for help. HOW LONG DO PEOPLE STAY HOMELESS? About 45 percent had been homeless for six months or less, about 20 percent had been homeless for between six and 12 months, and that about 36 percent had been homeless for more than a year, according to nonprofit research organization Economic Roundtable. "The majority of people who fall into homelessness figure out how to get out of homelessness without touching the system," said LAHSA's Hans. "Most cases are self-resolving." Helping people quickly recover and minimizing the amount of time they remain in the limbo of homelessness is a key part of the Los Angeles' overall homelessness strategy. With limited resources, government and service providers make a calculated decisions about how to use those resources in the most effective way. In other words, an 18-year-old who is homeless because they recently exited the foster care system will be a higher priority than a 60-year-old who has been homeless for several years. WHO GETS INTO A SHELTER? Of the roughly 53,000 people who are homeless in Los Angeles County on any given night, only about a quarter of them are able to secure a bed somewhere in county's disparate network of homeless shelters. The remaining three quarters of the homeless population, about 40,000 people, are left to shelter themselves on the street. Because the homeless population exceeds the number of available shelter beds, homeless service providers concentrate on a getting the most vulnerable people into the shelter system, particularly families with children, young people under the age of 25. Of the roughly 8,000 families who are homeless on any given night, about 79 percent of them are connected to a shelter somewhere in L.A. County, according to the 2018 homeless count. This includes about 5,000 children, who make up 9 percent of L.A. County's total homeless population. However, several thousand shelter beds go unused each night. On the nights when LAHSA administered the 2018 homeless count, about 13,000 shelter spots were in use, but another 2,500 shelter spaces weren't. KPCC has previously reported that homeless people may avoid shelters because of poor sanitary conditions or concerns over personal safety. That reporting prompted Los Angeles County to pass health and safety standards for homeless shelters, and develop a centralized inspection system. Expanding the capacity of L.A.'s shelter system is a priority for local governments. WHAT ABOUT PEOPLE WHO WORRY THEY MAY BECOME HOMELESS? Economic Roundtable estimates that about 600,000 Los Angeles County residents are in living situations where 90 percent of all household income gets spent on housing. It's this group of people who's most at risk for falling into homelessness, and not being able to recover. At the same time, most people in this group successfully avoid "literal" homelessness. "On any given day, over 90 percent of these extremely precariously housed individuals succeed in avoiding homelessness through employment, public assistance, housing support, help from friends and relatives, social services, and the generosity of people in their lives," wrote researchers.